Marketers and consumers alike are buzzing about Pinterest. With pinners exponentially increasing, the social media marketing opportunities on the network are rising, and businesses are sprinting to stay on top of this rapidly growly site. As Brafton reported, the site was named one of the fastest growing websites at the start of 2012. Users who like what they see from companies are highly likely to click through to more brand website content, with the site proving the fifth-leading social traffic driver, according to a Monetate report. Eager to tap into this new network for social media marketing, but not sure where to begin? Here are a few tips and best practices to help you connect and get started. A good way to gauge popular terms is to take note of what images generate the most engagement underneath “Popular” and categories relevant to your industry found under “Everything”. Incorporate these trends in your pins when for increased visibility. 2. Now get creative! Expand on the basic industry knowledge connections and product-centric boards by considering what topics convey your brand personality. Add to the user experience and create engaging boards that don’t necessarily promote a specific product but foster an understanding of your brand instead. The Chobani Pinterest account features a “Chobani Kitchen” board that exclusively displays dishes made with Chobani yogurt. Yet, Chobani strikes a balance with the “Nothing But Good” board which is a miscellaneous collection of “feel-good” images, ranging from motivational messages to pictures of cute animals that remind users the brand wants them to feel good (and look cute), with no mention of yogurt. 1. Start by finding out who’s already pinning about your brand. 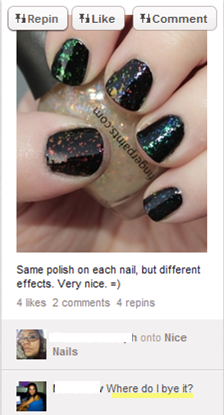 By visiting “pinterest.com/source/brafton.com,” we’re able to see all pins that originated from our website. Try swapping in your brand’s URL and check out the results. This may provide valuable insight as to what Pinterest users consider your best products, most intriguing or pin-able content, most valuable service, etc. 2. Take note of who is pinning and repinning your content. If the user is a regular contributor of pins relevant to your industry, reach out and follow them! In this sense, think of Pinterest like a visual Twitter. Its common practice to follow another user based on their shared content and indicated interests. 3. 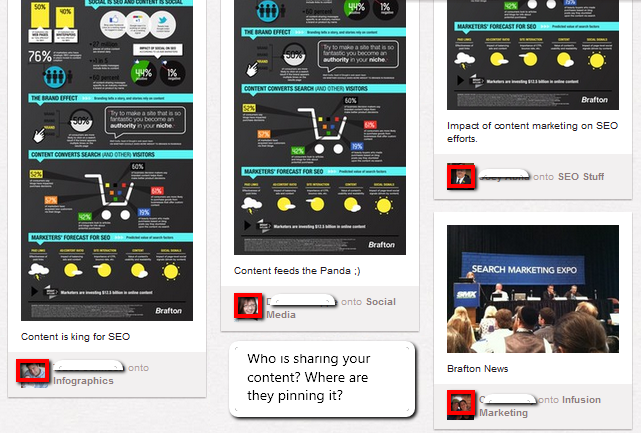 Seek out users pinning content related to your brand’s area of expertise. Search for applicable keywords and hashtags in Pinterest search and use the “People” filter to locate profiles with a particular interest in your industry. Since Pinterest does not yet have a follower recommendations tool, use these profiles as leads to pinpoint other users who follow and repin related content. 4. Be aware that you can follow specific board for an individual select boards rather than their full account. For instance, if you’re building a Pinterest presence for a graphic design firm, you might choose to only follow a user’s “Typography” board, rather than the user as a whole. This way you can avoid being updated with their “Favorite Hairstyle” and “Cute Puppy” pins (which is of course adorable, but may be less relevant to your brand’s conversation). 1. Once you’ve found your Pinterest followers, dive in and interact! Fuel conversation with “repins,” “mentions,” and “likes.” A repin is a powerful tool to add popular, well-received content to your own brand boards while also sparking conversation with the original pinner. Brands can use this to thank users for pinning their products or commend them for being particularly industry savvy. Just as brands do on Twitter, use mentions to tag other users in your pin. Mentions are an excellent way to foster brand/consumer conversation and interaction. Pinterest likes are an effective way to reach out users without having to follow or repin content to your own boards. A brand might find this useful if they’d like to comment on a popular pin but avoid featuring irrelevant content on their own profile. 2. Request followers’ input by creating open boards and designating users as “contributors” for appropriate topics. For example, this can be a great user generated content creation tool for fashion or beauty-related brands as it encourages users to pin themselves wearing their favorite products. 3. Host a social promotion to grow followers and engage users. Given that Pinterest has just cracked the top 10 social network list, I’m sure we can expect to see new restrictions on promotions develop in the near future, but for now brands and marketers have quite a bit of freedom to promote and run creative giveaways. Pinterest’s functionality naturally lends itself to facilitating promotions similar to fan picture contests on Facebook, for example. 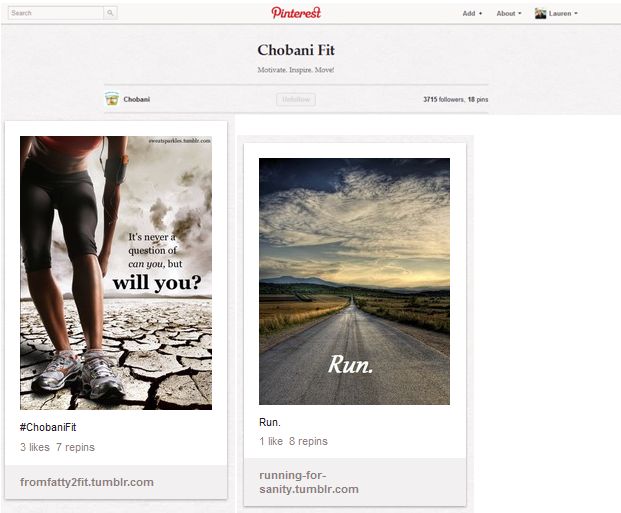 Still not sure if Pinterest is a fit for your brand? If you’ve got a quality content marketing plan in place, there is something you have to share – and the site’s rapidly growing user base should encourage you to consider it. Get inspired and check out over a hundred examples of brands on Pinterest. Happy pinning! Lauren is a former Social Media Marketing Executive on the Brafton Social Media Team. When she's not on Twitter, Facebook, Linkedin, or experimenting on just about any other social network, Lauren loves to go running and work on her amateur snowboarding skills.